Another new pattern launches on Monday! This week has been a whirlwind of Thread Theory excitement and activity after the Goldstream Peacoat tissue pattern launch and things won’t be slowing down soon (which is a good thing!). This coming Monday, March 17th, we will be launching the first pattern designed to be part of our Alpine Collection. The newest pattern will be available as a PDF and tissue sewing pattern in using the same style of packaging that you loved from our Parkland Collection. It will also be available as a complete kit which you will have an option to purchase either with or without the sewing pattern. As you can see from the photo above, the pattern itself will be available in a large range of sizes – size 24 to 36 are regular sizes and size 39 to 45 are graded with plus size proportions. You can also see that the pattern will be only a ‘two needle’ difficulty level. We hope that newer sewers will be encouraged to advance their skills by carefully following the thorough instructions (they even walk you through setting up your machine for the fabric required). We are currently in the midst of creating a sew-along for this new pattern, so get your pattern and fabric as soon as it is available so that you can join us for a chance to win an awesome prize package (more on this next week!). We’re looking forward to Monday, I hope you do too! Categories: Friday Posts, Thread Theory News | Tags: Alpine collection, pattern release, sew along | Permalink. As a male who sews , I am always looking for patterns to sew for myself. I often have to do a rub-off or make my own pattern. It’s fantastic to see someone addressing the lack of sewing patterns for men. Are you planning to add a pattern to your Alpine Collection that is like the Barbour-style waxed jacket that you show at the top of the post? I’m currently trying to sew the Burda Barbour Jacket 10/2010 #137 (a download from their magazine) with limited luck due to the lack of instructions on construction. If so, count me in. Thanks for your comment! 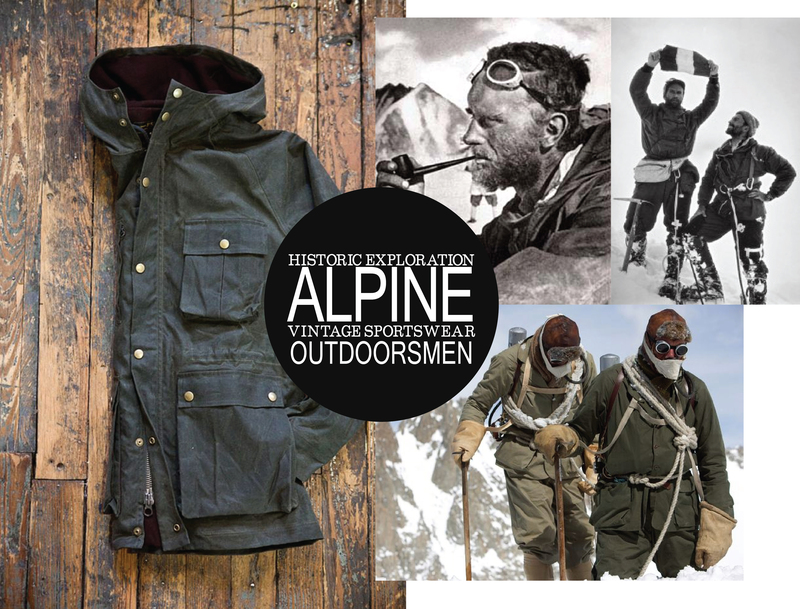 I love that waxed jacket, it is certainly one of the main pieces of inspiration for the Alpine Collection. We don’t have this design in the works currently but will consider it over the next year. Good luck with your Burda Jacket! I take it you are referring to the Oxford Cloth Button Down shirt? Yes, we will need to create a pattern for such a staple garment in the near future! Thanks for your suggestion! I feel like I know what this pattern is, isn’t it? You certainly do! 🙂 Thanks for being our pattern tester for it! I’m wishing you best of luck! Can’t wait to see the patterns! I am very excited to see the new pattern.